Below Kryll is a huge world filled with crazy adventures! 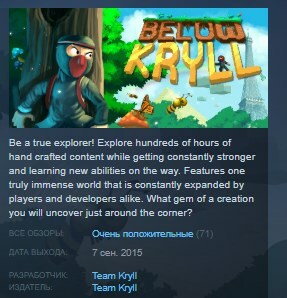 A tight single-player 2D platforming action-RPG at heart, Below Kryll is a vast, online, continuous world composed of developer and player made adventures. Grow stronger and learn new abilities the deeper you explore, while encountering all kinds of creations, from elaborate stories, puzzles, action, amazing pixelart, musical compositions, and tons of creativity - You can find literally hundreds of hours of quality gameplay already, with more adventures being created by the day. While completely optional, the game's super simple, yet powerful adventure creator ensures the world can easily be expanded by anyone in the player community. Expand the world with your own adventures, where everyone can play, rank, comment and reward you for your content with access to epic creation items! Help a desperate village by slaying a horde of blood thirsty monsters. Parkour your way up a giant crumbling skyscraper to find a rare medicine. Visit a huge pixel-art museum while listening to a soundtrack from a memorable anime. Solve an ancient riddle in a deadly tomb and uncover the mystery of it's origins. Take part in a plot to assassinate the leader of a murderous cult. This is just a tiny fraction of the adventures you will find while exploring the world of Kryll.